Paul Gravett edits and Peter Stanbury designs The Mammoth Book of Best Crime Comics. This is a 480-page collection of 24 mean, moody masterpieces, many painstakingly restored by Stanbury. They range from classic newspaper strips and notorious uncensored pre-Code comic books to the finest in American, British and European graphic novels. The line-up includes: Dashiell Hammett & Alex Raymond, Will Eisner, Johnny Craig, Mickey Spillane, Bernie Krigstein, Alan Moore, Joe Simon & Jack Kirby, Neil Gaiman, Alex Toth, Jacques Tardi, Jordi Bernet, Paul Grist, Jack Cole, Charles Burns, Max Allan Collins, and José Muñoz & Carlos Sampayo. 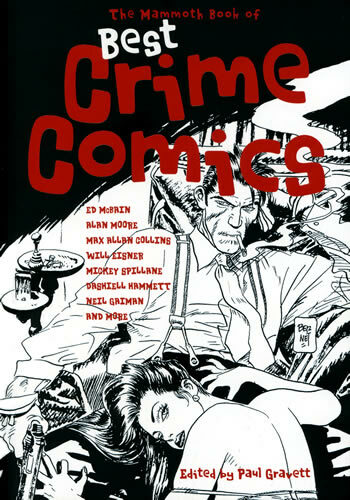 Highlights include the first comic book appearance by Mike Hammer’s prototype written by Spillane and shot from the original comic book artwork, and the never-before-reprinted last ever comic book by EC genius Bernie Krigstein, a bizarre 87th Precinct tie-in to Ed McBain’s famous characters. My new book, once again sharply designed by Peter Stanbury, is The Mammoth Book of Best Crime Comics, officially out July 18. You may have seen their previous fine comics anthologies, clocking in at around 500 pages, like Best New Manga 1 & 2 (the all-colour third volume is coming this autumn), or Best War Comics and Best Horror Comics. When Constable approached me to do a Crime collection, they were still looking at doing this book, as well as War and Horror, in the same smaller manga format, which would have seriously shrunk the comics pages down way too small. Thanks to our insistence, they enlarged the format of this series, and in fact for Crime Comics, expanded it a little further still, letting the pages breathe and fill the page area far better. Stories by Alan Moore top and tail the book perfectly and other contributors include Dashiell Hammett, Mickey Spillane, Will Eisner, Jack Cole, Jack Kirby, Jacques Tardi, Muñoz & Sampayo, Neil Gaiman and more. Another distinction is in Peter’s exemplary graphic design, which lends the whole 480-page compendium class and atmosphere. Peter also put in amazing effort to restore and refurbish the comics pages, which appear mainly in crisp black and white with no murky greys, to suit the strong, black-and-white noir style. And the contents really are some of the very best, no padding, no also-rans, but two dozen of the cream of crime comics, first-class throughout. Two pages, pages 150 and 151, are out of order in the Secret Agent X-9 story. After reading page 142, please jump to ahead to pages 150 and 151. Then return to pages 143 to 149 and resume from page 152. Apologies for this production error. Murder, Morphine and Me first appeared in True Crime No. 2, May 1947, not No. 3, July-August 1948.